I made a traditional cassoulet last winter full of white beans, duck and pheasant confit and sausage and shared it with you HERE. It was dark and rich and got slurped up in record time, rich as it was –– it was inhaled! I made it a few weeks later (back by popular demand) and same outcome. It was like a ravenous pack of wild beasties had descended on what I thought was a huge dish. What should have been enough for 8 was nearly gone with 3! When I began researching cassoulet for that post, I immediately turned to Paula Wolfert and her classic “The Cooking of Southwest France ” for direction. I realized I had owned that book for 25 years –– and it looks it. The jacket cover is tattered, the inside is splattered–– it is much-loved because it is beautifully written and researched and the recipes work perfectly, bless her. 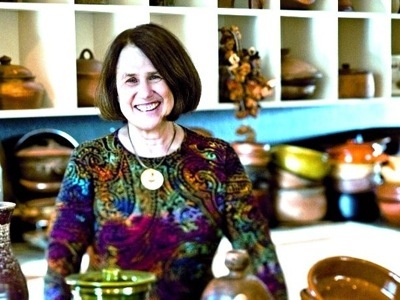 If you don’t have it and her other brilliant books on Moroccan and Mediterranean cooking (as well as a recent one on cooking with those gorgeous clay pots) you should… they are inspiring. Her chapter on cassoulet is magnifique, which is as it should be since she suffered for her art on this one. 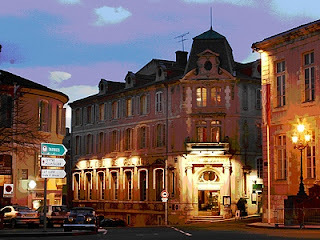 She went to the source of the dish in France and nearly tasted herself into a gastro-intestinal crisis trying all the versions… going from one recommendation to another, one town to the next. When she included the Prosper Montagne anecdote about a shop sign that announced “Closed on Account of Cassoulet” it was an accurate reflection of toll exacted for her quest… she took to self-medicating with Alka-Seltzer to survive the dangerously delicious ordeal. Wolfert tested 3 classic forms from the holy trinity of cassoulet towns in Languedoc. She tried the Castelnaudary version with pork, ham, pork sausage and pork rind, the Toulouse variety with confit d’oie (or canard) and Toulouse sausage and Carcassonne’s cassoulet with mutton (or partridge in season). All, however, do have beans as an ingredient although the meat/bean ratio and even the type of beans vary from recipe to recipe. She even wrestled with the breadcrumb conundrum –– classicists say never use them (they say the crust must come from breaking and reforming the natural crust 7 times, although most admitted to only doing it twice), yet she tasted great cassoulets using crumbs. It appears in all things cassoulet there is no clear consensus. Flying in the face of tradition, Wolfert even tried a Cassoulet de Morue made by Lucien Vanel at his restaurant in Toulouse. 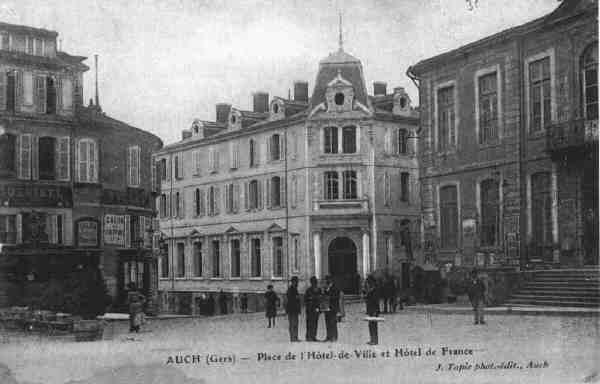 It was unorthodox indeed with cod, the ubiquitous beans, seafood sausage, and mussels in a saffron scented fish broth sauced with mustard, egg and cream and a soupçon of mischief as his fishy ingredients playfully winked at the meat-based bastion of classic Toulousean cassoulet. It was the same iconoclastic Vanel who inspired a young Ferran Adrià to march to his own drummer at about the same time Wolfert paid a visit in the early 80’s. Vanel once said “Cuisiner, c'est donner –– Cooking is giving”. I think Adrià and Wolfert would agree. I believe his cod cassoulet deserves a place at the table (and at mine soon!). The heroically determined Wolfert ate cassoulet in Paris, Toulouse, Castelaundry, Carcassone and Landes. She ate them in homes and restaurants, she even attended a cassoulet cook-off, but it wasn’t until she visited André Daguin at the Hotel de France in Auch that she found the best cassoulet EVER. Daguin is the champion of traditional Gascon cuisine and the creator of magret de canard as we know it –– a gently cooked duck breast, separated from the bird. 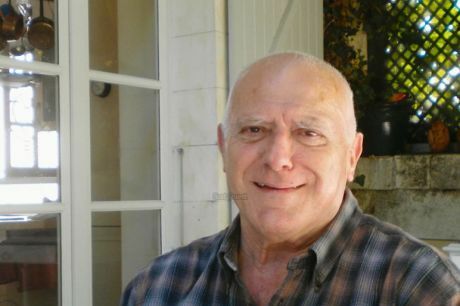 This man knows the ways of the cassoulet ––he makes the preparation sound positively liberating. In the preface to his cookbook, Le Nouveau Cuisinier Gascon he wrote: “To those intimidated by the clock: the longer a recipe cooks, the longer it gives you liberty; and the lower the heat, even though more time is needed, more energy is economized. The longer a preparation takes, the more your hands are occupied, the more it permits your spirit to be available.” (Thanks to Kate Hill at Kitchen at Camont for the translation!!). You’ve got to love a man who thinks that way. Cassoulet is SLOW food. Daguin prepared 3 cassoulets for her. He did the “normal” cassoulet with garlic sausage and steamed confit, a lentil version with the unusual addition of chorizo sausage and then… the winner… a cassoulet made from fresh fava beans, the Cassoulet de Féves with preserved duck and favas… “crisp on the outside soft and buttery-tender within. The contrast of flavors and the textures, the beans so full of spring and the Mediterranean, beans that absorbed the taste of the other ingredients and yet, almost paradoxically, maintained a fresh taste of their own –– I could not quite believe what I was eating. It seemed a miracle…. Daguin’s cassoulet of fava beans transcended definitions. As far as I was concerned, the cassoulet war was won.” After I read that… I was hooked. I begrudgingly bid my time until Spring when I could get fresh favas to make this –– I had to make it –– nearly a biological imperative. 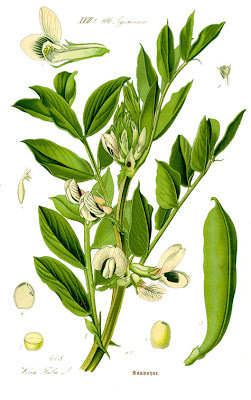 It is interesting to note that favas would have been the original bean for the dish, predating the New World beans that have become the standard. I would recommend this cassoulet as a sensational replacement for baked beans for an outdoor cookout… it will knock your guests off their lawn chairs… no fooling. Since there is more meat than beans in this version, it will feed a lot of people too. Can you imagine it sideling up to beautiful grilled meats and vegetables on a plate with a little forest of crisp salad beside it (although traditionally it is served by itself, with perhaps a light vegetable salad before it)? Your taste dreams will be filled with its gentle, green-tinted-ducky-piggy goodness all summer long. * Also, very inauthentically... leftovers were great with maple cornbread and broccoli rabe! 1 ½ pounds lean fresh pork belly in 1 ½” dice blanched, rinsed and dried (Available at D’Artagnan in a large piece- order by phone 800-327-8246). Warm the confit in a warm pan to melt the fat should there be any (the D’Artagnan confit has very little) and remove the duck, saving any fat you may have. Shuck the beans and discard the pods. You should have 2 quarts. Slip off and discard the skins of 1 cup of the beans, cut the shoots off the rest if you see them but leave the skins on… the skins will turn dark when you cook them… which is fine. Scrape or drain the fat off the confit and reserve if you have it, make sure you have one cup. Supplement with more if necessary. Sauté the onions in the reserved fat 4-5 minutes in a 5-6 quart casserole. Add the pork and pepper and sauté 5 minutes longer ( I tried to brown the pork a little so it took a few more minutes). Stir in the peeled favas and sugar. Cover and cook slowly for 10 minutes, mash the beans a little. Simmer pork skin in water till supple –– 10 - 20 minutes. Drain, roll it up and tie it with string. Place duck confit in a colander over steaming water and steam 10 minutes. Remove the duck and cool then remove the meat from the bones (this is a special trick from Daguin). Save the skin, cut into slices, separately. 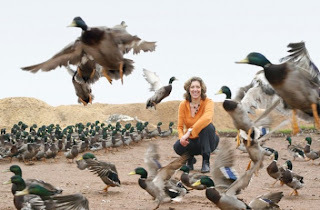 Cover to keep duck moist. Remove the pork skin, and slice. Unroll and line a 3 to 3-1/2 quart casserole (one that has a good surface area for creating the crust, the classic cassole is much smaller on the bottom than the top and is made of clay) with the pork fat side down. Put duck meat on top of that. Remove leek, thyme and celery from the beans and transfer beans to pot, straining out and saving the liquid. Skim the fat and add the juices to the meat to cover… reserve remaining juices and add as needed. Add the optional herbs and spices. Taste for salt, some confits are salty, mine was not. Add additional salt at this point. Cover the dish with the foil and cook 20 minutes. Spoon off the fat (about a cup) Add enough juices to keep the beans moist (heed this… I added more than I should have and had to remove some later). After an hour, remove the foil sprinkle the armagnac over the top and push down the top to blend then put back in the oven and allow crust to form which takes 30 minutes. Mine was too liquid ( I had put in too much of the stock—I should have left 1 cup or so out) so I pushed it down and got a 2nd crust, adding another 20 minutes to the time. Sorry to those of you who are having trouble commenting... it seems blogger is having issues that they are working on. I wanted to thank Paula Wolfert and Ariane Daguin for their help on and inspiration for this post. Trouble posting a comment here but will try again since I see you just commented! This dish look luscious and I'd love to find fresh fava beans. I don't think I've ever seen them! I'd love to try this instead of the traditional baked beans, like you said. I am glad to have gotten my computer back just to come here to visit you and learn something! As I do each time you post! I have the utmost respect for Paula Wolfert and for you for recreating this dish so masterfully! Amazing the reserach and dedication in this post! Beautifully written as always. I think I'll have to check out a vegetarian version of this (I know, what an insult) because your cassoulet looks so amazing. You have to admire the French for their passion for slow food and developing great dishes. CASSOULET IS MY FAVORITE...maybe it's the beans reminiscent of my own Hispanic heritage, or maybe it is the lovely texture of the duck, but this dish is a comfort for any season!!!! And of course, you always consult with the best of the best. Thank you dear for visiting with me this morning; it has been a remarkable year of learning, teaching, learning and more learning...ON MY PART!!! WHEW am I ready for a CASSOULET!! I wills end this to my DSIL..this is his kind of dish..he has made many cassoulets..one took 4 days:) He is a superb chef:) Not pro..just home.. Fascinating! I can think of worse fates than having to eat my way to heaven dining on cassoulet! The green fava beans do look lovely and indeed remind me of spring (which is nearly over). But, shucking 9 pounds of pods? How long did that take? You are certainly dedicated to the craft! HI Deana - your posts are always so enlightening. I really appreciate your attention to detail, so interesting. And am so jealous of your fabulous dinnerware! Ha! There was a restaurant in Paris (I'd have to ask my daughter the name) that had the best cassoulet I've ever eaten. And yes, a bit of a tummy upset after, but then I never go anywhere without the proper medications. :) I certainly wouldn't forego the eating! Only have made one at home. Took forever, but it was excellent. It's been a while. I had no idea there were so many verions, but I should think it makes sense for each chef to have his own specialty, or even several versions. Your fava bean (what a pain I found them....I give you all kinds of credit here) cassoulet would definitely knock anyone's socks off at a bbq! Good heavens. How divine. Well, it's always a good time when you can knock guests off their lawn chairs, isn't it? Apart from the entertainment value of that particular feat, this looks like a nice filling meal for summer or winter! I love cassoulet. Haven't made it in ages. Have to try this recipe! it's easy to see why that cassoulet disappeared so quickly, it looks and sounds delicious! I have only made Cassoulet a few times and never with all of those wonderful ingredients, I actually make it at school for the students so it's a modest version. Thank you so much for sharing this wonderful dish with us!